The clock is always ticking. The collection and delivery is never up to the mark. Competition is increasing and Overheads are raising with zero tolerance customers. The ultimate goal is saving costs and increasing the efficiency of task planning. Presently every organization wants to keep track of their revenues on a regular interval. So, timely revenue inflow has become a critical issue to every organization and managing millions of customers through an efficient system is a challenge. Give your employees the device they need to get the job done right. Your employees can redefine productivity with this device in hand. 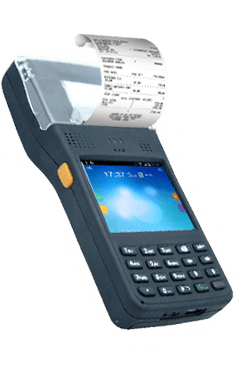 With the handheld device you can collect Cash / Cheque / DD / Debit / Credit Card on the field on-the-go. This device is one of the toughest and most flexible handheld devices in the market. The device has the ability to connect virtually to any back end system carrier in the world. The device is rugged enough for any environment and can serve your business lifelong.